According to the "Notice of the General Office of the Ministry of Industry and Information Technology on recommending the pilot enterprise for the integration of the Informatization and industrialization management system in 2018" (the letter from the Ministry of Industry and Information Technology letter  No. 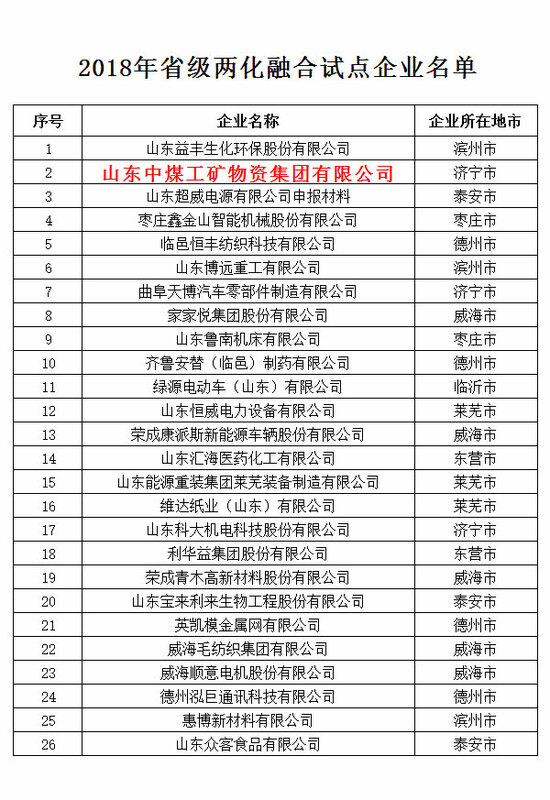 128) and the Shandong Provincial Economic and Information Committee "about 2018 In the following year, the Shandong Provincial Economic and Information Committee officially announced the list of pilot enterprises for the integration of the two provinces in Shandong Province in 2018. China Coal Group was once again successfully selected for its outstanding achievements in the integration of the two industries. As the pilot enterprise of Shandong Province's two-in-one integration management system and the outstanding enterprises of Shandong Province's two-in-one integration, China Coal Group has vigorously promoted the “Internet+” development strategy around the country and actively promoted the in-depth integration and development of enterprise informationization and industrialization. Vigorously develop the industrial supply chain e-commerce, successfully transformed from the traditional sales model to the modern e-commerce sales model, and became the model of the industry that promoted the successful transformation of traditional enterprises through the e-commerce information industry, and walked in the innovation development of the national integration of the two industries. The forefront of many companies has been highly praised by state leaders. At the same time, the industrial Internet platform of the coal machinery industry, which was independently developed and operated by our group, was listed as the key support project for cross-border e-commerce and the key platform for e-commerce in Shandong Province by the Ministry of Industry and Information Technology. It has made outstanding efforts to promote the deep integration of the two countries. contribution! This time, our group was successfully selected into the pilot enterprise of Shandong Province's two-in-one integration management system in 2018. It is the reaffirmation of the achievements of the integration of the two coal blends of the China Coal Group by the Ministry of Industry and Information Technology and the Shandong Provincial Economic and Information Commission. Development has set a model benchmark. In the next step, China Coal Group will continue to adhere to the development path of informatization and industrialization, thoroughly study and practice the scientific development concept, actively explore new ways and new methods for the integration of enterprises in the new situation, and make full use of the integration of our group in the country. The unique advantages in innovation and development, share the successful experience of enterprise innovation and development, and play a good role as a model to make more contributions to the development of national integration and innovation!